This year I'm feeling really focussed, which I'm achieving through seeing each month as an opportunity to achieve something and not simply looking at the overall year. I've come to the conclusion that this is the most effective way to achieve anything throughout the year, you have to remain focussed on a variety of things. 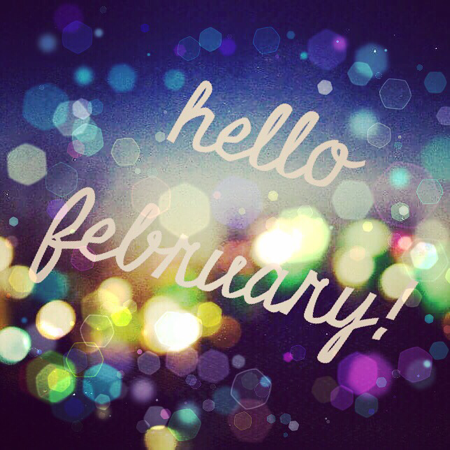 During February there are several things that I'd like to concentrate on; February is a short month, so I've kept my plans fairly short and fairly realistic. 1. I'm planning to focus on my new job and really give it my full 100% as I want to improve as much as possible. It's a fantastic opportunity and one that I really, really don't want to waste. I'm definitely one of those people who learns something quickly but I struggle to be good at it and therefore I feel as though I have to constantly practice. 2. I want to start planning out a new hobby, which is going to be scrapbooking. I have so many ideas and also so many photographs and memories to place inside it. Now that I'm working less I want to force myself to enjoy something and basically get out of bed and be more productive. As I already have 90% of the materials that I'll need I have no excuse not to start! 3. My boyfriend is a huge priority in my life and I feel like I don't appreciate the time we spend together enough; I work in the days now and he works in the night so I want to appreciate the time we spend together much more and hopefully get out of the house and enjoy the world more. Even if that means going to a park or a coffee shop, it'll be nice just to do something a bit special a couple of times a month. 4. I need to force myself to text some friends from university, from school... Even from my old workplace! I want to rekindle old relationships and really make an effort to keep my friendships as they were obviously formed for a reason so it's a shame not to keep them up. I really miss some people and that's something that I can make an effort to change.